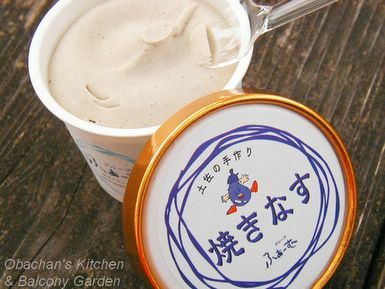 Obachan's Kitchen & Balcony Garden: Yakinasu (Grilled Eggplant) Ice Cream! Yakinasu (Grilled Eggplant) Ice Cream! This could be one of the weir... , no "adventurous" ice creams we have in Japan. This is yakinasu (grilled eggplant) ice cream made in a town called Aki in this prefecture. Yes. They really mix in grilled eggplant (puree) when making ice cream. * I bought this at a souvenir shop at Katsurahama beach when I visited there last Sunday for Ryoma Festival. hmmm grilled eggplant and ice cream. my mind fails to make the connection. But the it fails connect red beans and ice cream too. When my bro was here on vacation, he was experimenting with different icecreams available in the store here. he bought a whole pack of the bean ice cream. that pack had to be thrown out eventually. The mind simply did not make the link. I think many asian cultures use red beans as a sweet dessert form of some sort -- seems normal to me to have it as a flavor for ice cream. I don't associate adzuki beans with anything but sweet taste, really. It would seem strange to use it in a savory dish! mmm....eggplant ice cream. nothing is weird really, its all in the mind! I love grilled aubergine but not in ice cream!Though I'm sure you wouldn't taste it if you didn't know as happened to me with tofu ice cream! I'm laughing, and I haven't even tasted it! Funny. Hmm...eggplant ice cream sounds interesting. I like eggplant okay, but it's good to be adventurous! The "weirdest" ice cream flavor I have tried was corn and cheese. There's a restaurant in NYC owned by chef Mario Batali called, Otto, that I'd like to visit one day, and I heard that their corn gelato is very good. They also make olive oil gelato which I heard was delicious and "Gorgonzola Dolce" gelato, which is a curious flavor! Grilled eggplant ice cream!! Hehehe! Man! That is WEIRD! My fave ice cream flavours are from the Philippines; Macapuno (young coconut)and Ube (purple yam). In Brunei we also like red bean ice cream. Yum! Do you think they're weird flavours? Thaaniya: In the US, coconut is fine for dessert, but yam or beans is weird. And yet -- we're making sorbets with black pepper and tarragon. Azuki ice cream is my mom’s favorite. I hated it when I was little, but now I like it, but my dad never even wants to try it. The biggest difference is that with this ice cream, you really taste the grilled-eggplant flavor. There’s no doubt about it. And that’s what that really makes us --- well, at least some of us --- laugh. No. They all sound really yummy! We have purple sweet potato ice cream here and that’s one of my faves. that kit kat has an obasan flavor in japan?!!! Yep. I know what you mean. I’m really tempted to have people from different cultural backgrounds taste this ice cream and see how they would react. Well, joking aside, these are the recent ones. I live over in Kitakyushu, and on a big day out to Fukuoka visited an icecream shop which included this tub, but the flavour I ended up eating was the takoyaki. It had the opposite effect to this yakinasu, as I was unable to think about it without a little retching. Maybe I will try the yakinasu next time. You mean takoyaki ice cream with real octopus bits in?! OMG!! ":O THAT sounds a little too adventurous. But I want to give it a try -- just a little bit to see what it tastes like.